Peaceful demonstrators gathered on the front lawn. 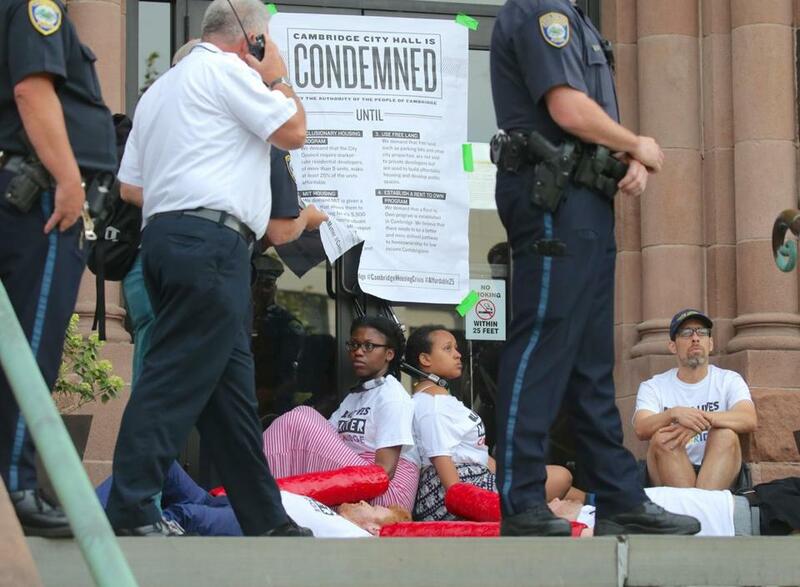 CAMBRIDGE — Four protesters were arrested Wednesday after locking themselves to the front doors of City Hall during an hourslong rally that at times grew tense as elected officials and demonstrators argued about the city’s affordable housing policies. Two women used U-shaped bike locks to connect themselves by the neck to the handles of the building’s doors around 6 a.m. The women were also linked to two other protesters — both men — whose arms were connected inside plastic tubing wrapped in red duct tape. 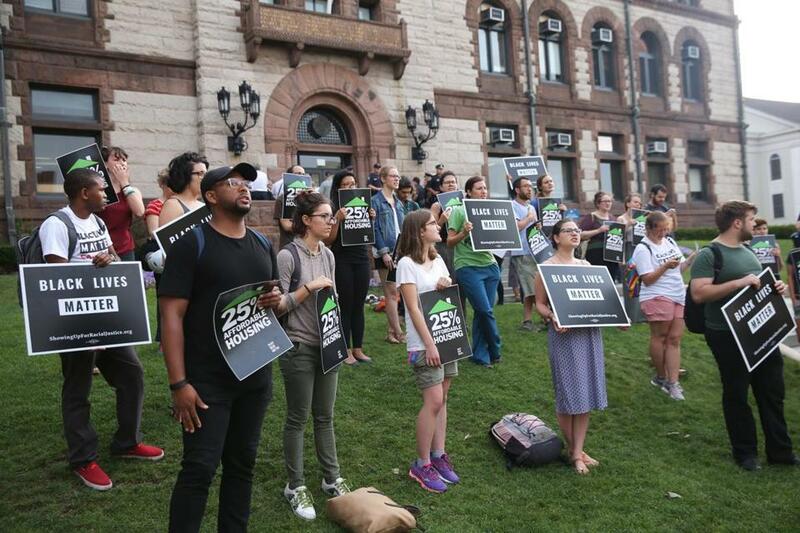 The protesters, who wore “Black Lives Matter Cambridge” T-shirts, were part of a larger demonstration that began with a peaceful march through the streets and ended on the front lawn of City Hall. A woman who would identify herself only as Stephanie, a co-organizer of the protest, said the group was calling on city councilors to pledge to vote in favor of requiring developers with more than nine units of housing to make 25 percent of their developments affordable. She said she believes Cambridge is struggling to meet its affordable housing goals as the city’s housing market grows more expensive. Demonstrators have chained themselves to City Hall to draw attention to the issue of affordable housing. City officials are considering new rules that would set aside 20 percent of units in new housing developments at rents that are affordable to lower- and middle-income residents, nearly double the current rate of 11.5 percent. But developers have pushed back, arguing that such a requirement would stall construction. At a Council hearing Tuesday night, developers and the Cambridge Chamber of Commerce argued for the new rules to be phased in over time. Vice Mayor Marc McGovern, who spent the morning speaking to protesters who had gathered on the front lawn and were singing, chanting, and holding up signs, said adjusting the rules is a complex, multistep process. By 9 a.m., police had cleared the protesters from the front doors by removing the handles. Police then slipped “skeds” — yellow, sled-like devices used by first responders as stretchers during rescue missions — underneath the demonstrators and pulled them away from the entryway. Police later surrounded the protesters — the women remained locked together by their necks, and connected to the men — in the corner of the landing at the top of the steps. For a time, the protesters remained on the ground but later carefully stood up together and made their way to the waist-high wall at the edge of the landing to face the large crowd. Protesters used bicycle locks and chains to block the front entrance of Cambridge City Hall Wednesday morning. Cambridge police spokesman Jeremy Warnick said employees used other entrances to get into the building during the demonstration. 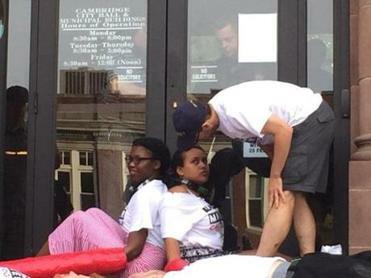 The four protesters were eventually arrested around 2:30 p.m., after about eight hours. “We did arrest the four individuals without incident after making several attempts to receive cooperation,” Warnick said in a statement. Warnick said Andrew King, 30, and Abraham Lateiner, 34, both of Cambridge, and the two female protesters, who are juveniles, were arrested for disorderly conduct. Lateiner is also being charged with interfering with a police officer, Warnick said. Throughout the morning, people in the crowd shouted, “The people united will never be defeated!” and “Brick by brick, wall by wall, racist systems have to fall!” in a show of support for the conjoined activists. Mayor Denise Simmons arrived to greet protesters just after 11 a.m. Standing on the top landing, she spoke with affordable housing advocates. Simmons then addressed the crowd, saying it’s hard to pinpoint exactly when policy changes will be made. But she assured protesters that elected leaders were working to address their concerns. Globe correspondent Dylan McGuinness and John R. Ellement and Tim Logan of the Globe staff contributed to this report. Steve Annear can be reached at steve.annear@globe.com. Follow him on Twitter @steveannear.